DESCRIPTION: It’s a 5k and 1 Mile Fun Run with a serious splash of color and fun! 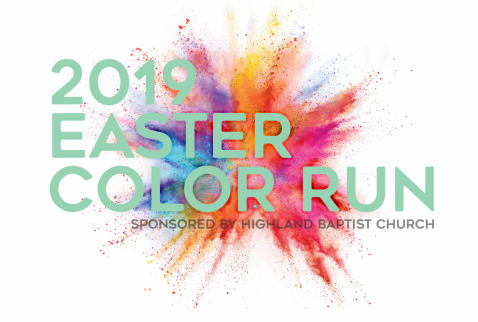 The Easter Color Run 5K and 1 Mile Fun Run will be held Saturday, April 13, 2019. The 5k will begin at 8:00 AM. The One Mile Fun Run will begin at 9:00 AM. The Awards Ceremony will take place at 9:30 AM. The race will begin and end at Highland Baptist Church (219 Simpson Street, Florence, AL 35630). All profits from the event will go to Safeplace Inc a nonprofit organization in our area whose mission is to promote healthy relationships by providing education, intervention and safe places. Programs include not only shelter and counseling for families homeless due to domestic violence, but also outreach programs such as court advocacy services, prevention education programs and batterers intervention programs. All registered participants will receive a T-shirt* (guaranteed for those registered by April 1) and a bag of color for the final throw. The 5k race will include timing, and awards will be given to the top 3 male and female finishers overall and top 3 male and female finishers in each age category: 12-under, 13-19, 20-29, 30-39, 40-49, 50-59, 60-69, 70+. Early material pick up will be available in the CLC of Highland Baptist Church on Friday, April 12 from 8:00 AM - 1:00 PM and on the day of the race beginning at 6:30 am.